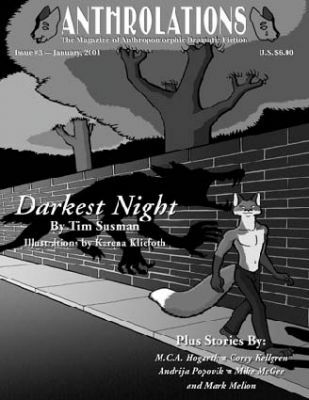 Debuting in January 2000, Anthrolations: The Magazine of Anthropomorphic Dramatic Fiction showcases character based stories employing anthropomorphic animals in a variety of themes and sub-genres. It has enjoyed fan and critical acclaim, including several Best Fanzine nominations and multiple individual story and art Ursa Major Awards. Darkest Night by Tim Susman. Illustrations by Karena Kliefoth. Werewolves Anonymous by Mike McGee. Illustrations by Brian Reynolds. Drowning in Moonlight by Andrija Popovic. Illustrations by Stephanie Hahn. Dark Lighthouse by M.C.A. Hogarth. Illustrations by Phil Morrissey. The Significance of Siam by Corey Kellgren. Illustrations by Lonnie DiNello. The Brave Little Cockroach by Mark Mellon. Illustrations by Frank Villarreal.